'Star Wars' Blu-ray Deleted Scenes Preview! Not too long ago, at Comic-Con, that for some is far, far away… Attendees at the Star Wars Fan Movie Awards just got a sneak peek at some of the deleted scenes included on the upcoming Blu-ray release, and now you can, too! Punch it, Chewie! 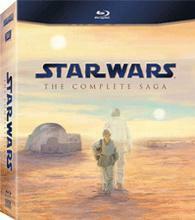 You can find the latest specs for 'Star Wars: The Complete Saga,' 'Star Wars: Prequel Trilogy,' and 'Star Wars: Original Trilogy' linked from our Blu-ray Release Schedule, where they're indexed under September 16.